It's finally time! Detective Lindsay Boxer is in labor--while two killers are on the loose. A rising star football player for the San Francisco 49yrs is the prime suspect in a grisly murder. At the same time, Lindsay is confronted with the strangest story she's ever heard: An eccentric English professor has been having vivid nightmares about a violent murder and he's convinced is real. Lindsay doesn't believe him, but then a shooting is called in-and it fits the professor's description to the last detail. 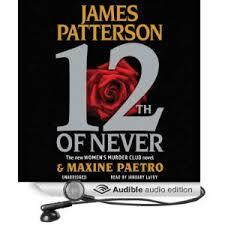 If there is one author i keep coming back to read more and more is James Patterson. This is the 12th book in the Women's Murder Club Series. I did enjoy most of the books in the series but not all of them. There was also the side story about Lindsay Boxers new born baby being sick and how that was resolved which was another interesting aspect to the entire story. Having said that I really didn't like how she went back to work when her baby was sick in hospital. I would have given the book 5 stars if it weren't for that. I know she is one of the main characters but............... Also I know it's a long time since my children were babies but I don't remember jiggling a newborn on my knee. But that's just being picky. My kids were a totally a two different story, i can write a book on each of my boys ... lol ..
P.s. Highly recommended not only to James Patterson fans but to all those who loves to read mystery and suspense.